Back to sandwiches and salads and the hum and buzz of Rotarians meeting and greeting. Her Honor President Gayle opened the meeting on time as usual. Bob Peterson led us in a thoughtful invocation and the Pledge of Alliance was led by Don Anderson. Meeting set up included the usual suspects: Duncan Cook, Ward Fletcher, Bob Hammar, Rob Erb, Troy Wilcox, and Terry Roarke; Ward Fletcher did double duty on the Paul Harris table where $414 was collected; Chuck Hellar sold raffle ticket sales and was Sergeant at Arms; Paula Olson was bulletin writer. Troy Wilcox was the photographer. The auction table was womaned by Christine Vu, Anne Enquist, Kendra Riconosciuto, Jan Gee, and Sally Smith. 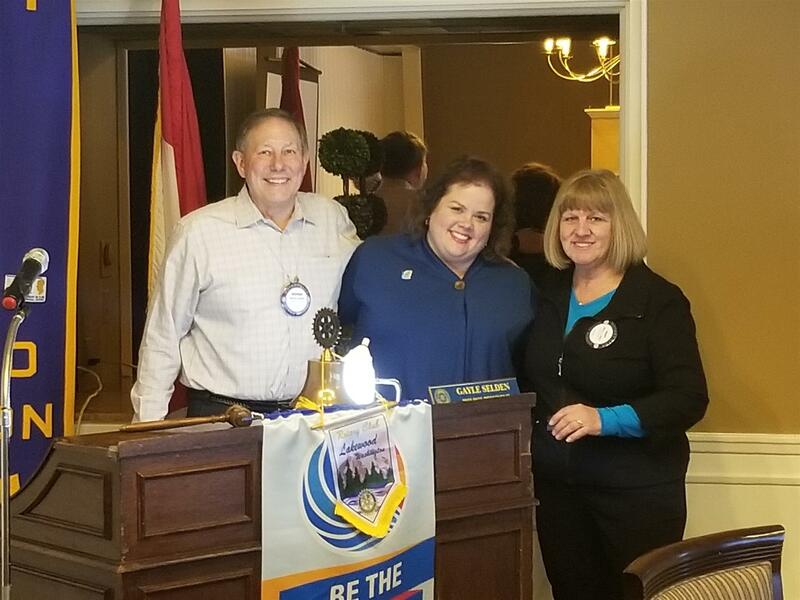 We had an honorary visiting Rotarian from Edmonds – John Magnuson and another Rotarian, Michelle Douglas, our presenter. Guests included Shalom Aburie, a fashion designer from Uganda introduced by Chris Kimball. There was no Sunshine Report. President Gayle applauded our new puffin, Brian Ivey for taking such good care of his puffin by seatbelting the little fella in the car. She was happy to see healthy members returning to the fold. 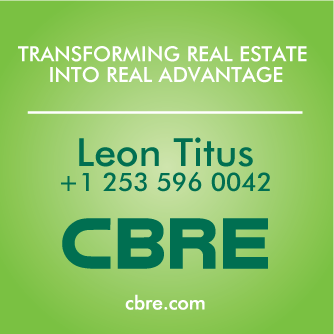 She also corrected Brian’s business as commercial insurance rather than commercial real estate. President Gayle announced that members going to the District Conference on May 9th through the 11th now numbered 10. Yeah!! Steve Enquist presented Mary Horn with her fifth Paul Harris. Thanks, Mary, for your generosity! Next was a special treat – a rare performance by John Magnuson on guitar and Chris Kimball on cow bell. John played and sang his version of a Rotary song with Chris adding some well-placed beats on the bell. The performance was really an advertisement for an auction item where he and Greg Rediske will write and perform a special unique song written just for the lucky bidder. At the end, Rick Selden stood up to tell Brian Ivey that we are not a singing club even though we have crooned at the last two meetings. President Gayle updated us on the Sportsman’s Dinner and Auction. She is very impressed with the team efforts for procurement with some great items. The Elton John concert is sold out by early bird members buying tickets. Mary Horn’s team, the Soaring Eagles, has 100% participation, and Mark Edgecomb’s team came up with a Tampa Bay fishing trip. There are lots of trips and fun things to do on sale at the auction so come prepared to have a great time and close in on some great items. We are 30 seats away from a sell out for dinner (and we are even less than 30 seats away at this juncture), and for the first time, we had to increase the number of dinners ordered. Sally Smith announced that tickets for the Texas Hold ‘Em Tournament at Thornwood Castle are on sale now, thanks to the efforts of Barb Spriggs and Jason Whelan for landing the ballroom. There is room for 24 players and 24 observers. On another Auction note, we could use at least five more volunteers for the April 13 Saturday morning setup (8 AM to 12 PM); at least five more volunteers to assist with the April 12 Friday pre-event setup (2 to 6 PM); five more volunteers for the April 14 Sunday morning cleanup (8:30 to 11:30 AM); a few volunteers for the cleanup right after the event; another 3 or 4 volunteers for raffle ticket and drink sales; and two more volunteers to oversee the closing of silent auction tables (supervising youth volunteers who will be assisting with closing the tables). Finally, one more adult bid recorder and one more adult bid spotter would be fantastic (we have student volunteers help with bid running and bid spotting, hence the word "adult," which may or not mean "Lakewood Rotarian"). Thank you to all who have volunteered to make this Auction a smashing success! What are we going to do with all the money we’ll net from the auction, you are dying to know. 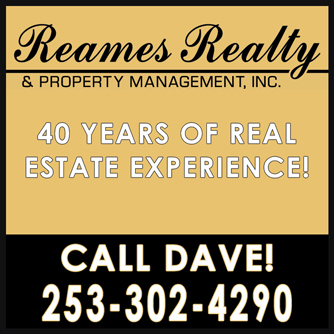 Gayle says that we will spend some on Fort Steilacoom putting up plaques around the park with poems in our effort to connect the community. She encouraged everyone to check out the pavilion with the bricks. Chris Kimball announced that Woodstick is back on May 18th at the Armory. He shared the history of Woodstick that started in 2003. It faded but is back. The program will benefit homelessness. Chris asked for Rotarian volunteers to take money as for some reason he trusts us more than others. Christine Vu announced the Text USA to 31996 campaign. Tito’s Vodka will donate $1.00 to the USO Northwest for every text to that number. Once $10,000 is earned, Tito’s will double it. At crown time, Pres Gayle commented that her crown was getting worn out and a little unstable. She picked on Chuck Hellar for missing many meetings. He confessed that he was suffering in Florida. It was 72 degrees when we had snow. He shared some of his winnings on the success of the Broncos. Turns out he and his buddy bet on the Super Bowl and loser pays but chooses the charity. Chuck chose EFN. He’s been gone for five weeks and he’ll pay $5.00 a week but he was tapped out from all the tickets he had to buy and had to pay on the “easy time payment plan.” Gayle says she doesn’t like to hit up new members for money but she had to use the opportunity to let Diedre Soileau, Interim President of Pierce College, blow her horn. Pierce College received a $100,000 Aspen Prize for Community College Excellence. Pierce is in the top five community colleges in the nation based on student success. She paid $100. Ed Shannon proudly announced his granddaughter was named a National Scholarship winner. He paid $20. 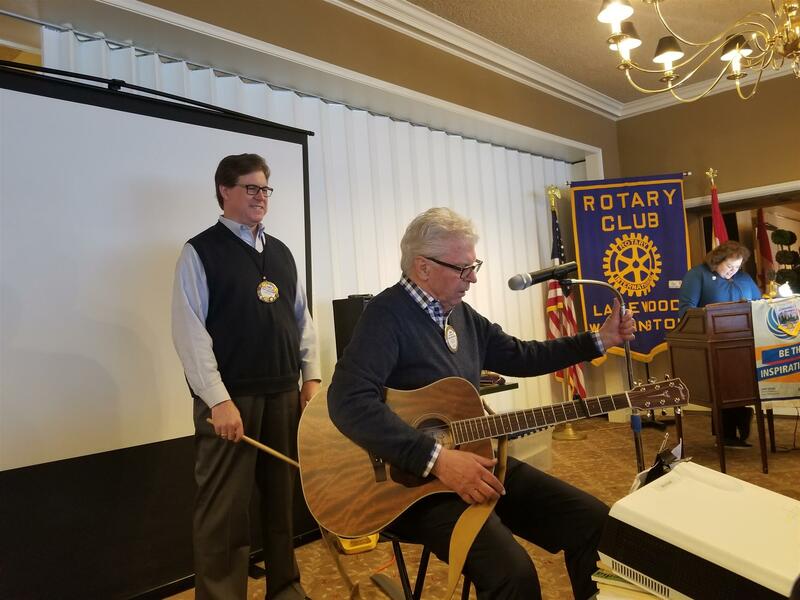 John Magnuson shared his experience joining Edmonds Rotary where people looked at him and whispered “who’s the old guy?” He paid $100 to visit his old stomping grounds. Troy Wilcox paid for celebrating his 19th wedding anniversary and Gayle thanked him for his hard work on the auction. Rob Erb paid $20 because his wife says the remodel is almost finished. Peter Marsh’s daughter, at 42 years, is the youngest tenured professor at Gerogetown. Jay Mayer talked about his European trip where his wife got separated from them on the Tube in London. Jason Whalen showed off his vacation beard grown on his stay in Hawaii. He paid $49, saving $1 for the razor. Sally Smith introduced our speaker, Michelle Douglas, the new Executive Director of the Emergency Food Network. Michelle came to EFN from a long business career with the Tempest Lounge. She was raised in Delaware as the youngest of eight kids. She came to EFN in 2017 and has been the Executive Director for the past six months. Michelle asked for a show of hands of anyone who had any connection to EFN. Of course, most raised their hands and she thanked us for our long commitment and many contributions to EFN. The mission of EFN is that no one goes hungry. 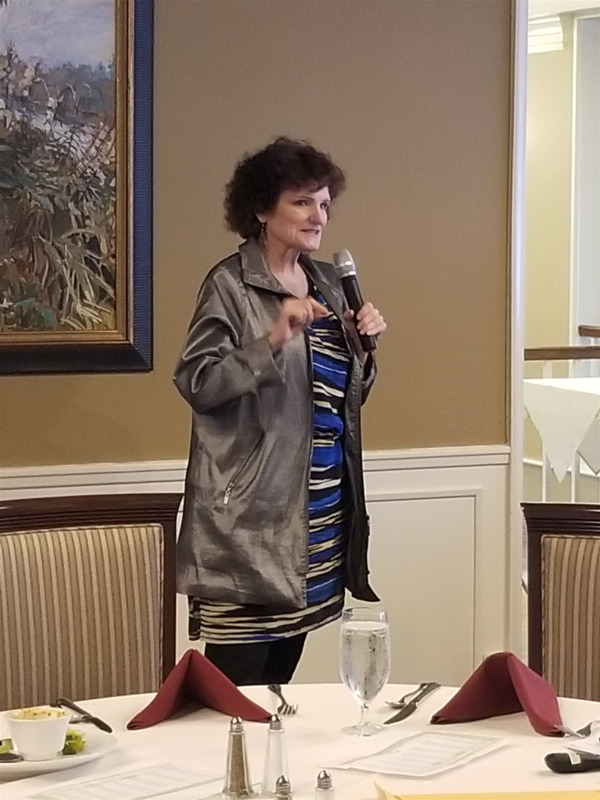 She shared some heartbreaking numbers: One in eight people in the state are hungry, one in seven are hungry in Pierce County and one in five are children. There are 58,000 free or reduced lunches served in schools. Hunger is one of two most vital issues, the second being housing. The fastest rising group of people so affected are seniors on fixed incomes while expenses rise. They also need specialty foods that are more expensive. EFN is a distributor of food to 76 partners, which include food pantries across the city. EFN feeds all kinds of people and are helped by all kinds of people. There are union peanut butter drives, which is a wonderful food that doesn’t need cooking and is nutritious. EFN does co-op purchasing in mass quantities. They buy items like rice, oats, pasta, bean, frozen protein like chicken wings and dairy, which is the most expensive. Every $1.00 donated buys five meals. In 2018, EFN dealt with 13.9 million pounds of food worth $21 million. They have a $2 million budget with 22 staff persons. Michelle talked about Mother Earth Farm, a nine-acre farm leased by the Hightower Family for $1.00 a year. EFN grows 110 varieties of food on the farm, including specialty products. There are nine staff persons and many, many volunteers. Some volunteers are inmates at the Women’s Correctional Center at Purdy. They participate in a program that gives them a pathway out of poverty. Schools and corporations also help out at the farm. EFN sponsors the Break Bag program, giving back packs of food to children at school breaks, such as Spring, Thanksgiving, and Winter breaks (which Lakewood Rotary has participated in for years). They distribute 2,000 bags of food to kids, which are packed by 100 volunteers in one day. 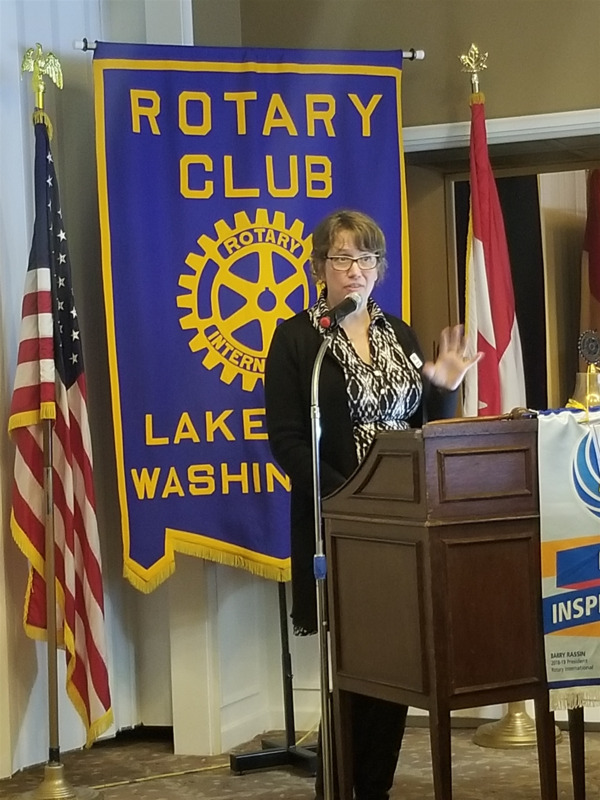 May is Hunger Awareness Month and our own Dr. Rooks is a team captain for Lakewood Rotary, participating in a run at Fort Steilacoom Park on May 4, 2019. The event is using the Pavilion and she encouraged all of our support. EFN is proud of its new warehouse and they have built a community garden to detract from the noise created by the trucks coming and going from the warehouse. Taking questions from the floor, she said that students under 15 years need a guardian to accompany them. Anyone can work at the farm, though. The government shutdown doubled or tripled the hunger impact. EFN buys meat particularly chicken and turkey legs. Fred Meyer’s lets them collect food twice a week but EFN doesn’t know what it will get. They have a limited budget and meat is the most expensive food. Thank you, Michelle, for an informative snap shot of EFN and hunger in our county. Raffle winner was Don Anderson and he pulled a white one for $5.00. Remember: Read this bulleting and tell Greg Rediske so you can get a make-up. Also, if you shop online, do so at Amazon Smile so a portion of your purchase can be allocated to Lakewood Rotary.